As “climate change” has penetrated further into our daily vocabulary and 21st century decision processes, popular literature and press often assume an anti-growth posture that may constrain economic activity in developed countries. Thousands of entrepreneurs, supported by hundreds of millions of dollars of capital investment are working to develop new energy sources or more efficient ways to consume energy in existing applications. Generally, these technologies utilize carbon-based energy offering low net increases in carbon footprint or non-carbon methods such as solar, wind power, water or even nuclear processes. Other technologies utilize silicon or biological based device or process improvements to reduce carbon consumption by raising process efficiencies. This paper will show that energy efficiencies are achievable in transportation from available and easily adopted technology platforms, such as RailRunner. A modest shift of 1% of short haul traffic from road to rail using such a platform can save over 100 million gallons of petroleum-based fuel annually. Surface freight transportation in North America involves an annual expenditure of more than $300 billion1. Highway freight traffic represents 55% of the total. Highway vehicles transport 8.85 billion tons of freight and highway vehicles overall consume 172 billion gallons of petroleum-based fuels of which 34 billion gallons are annually consumed in the delivery of freight by trucks. Class I railroads (large operators with more than $350 million in revenues), on the other hand, consume less than 4.1 billion gallons of fuel, first because they carry less freight than trucking firms and second, because they can carry a ton of freight 457 miles on a single gallon of fuel (457 ton-miles per gallon),whereas trucks can carry that same ton only 123 miles per gallon of fuel (123 ton-miles per gallon). 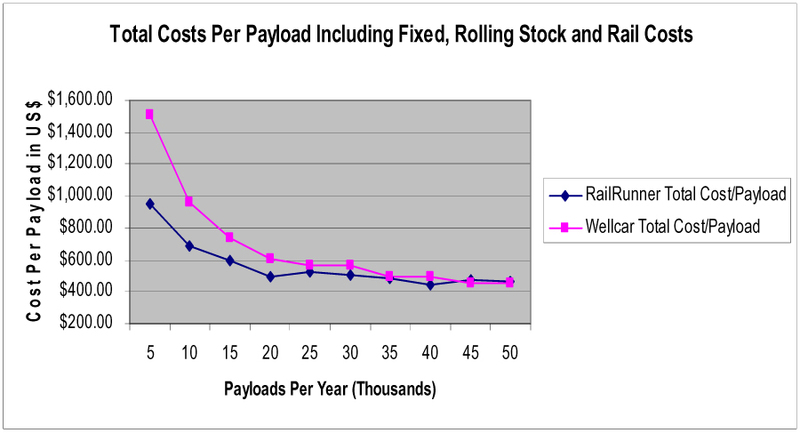 Table 1 below (from Transearch, Inc.2) shows modal shares of freight for selected Lengths-of-Haul (LOH). Carload freight is mostly coal, aggregates and grain by weight, bulk materials that have long traveled rails. Intermodal rail freight comprises Container-on-Flat-Car (COFC) or Trailer-on Flat-Car (TOFC) rail operation that is most readily substituted for highway freight traffic. A closer look at the intermodal rail segment reveals that most intermodal traffic operates in lengths-of-haul longer than 1,000 miles. US railroads (especially Class I railroads) have learned to make money with long trains running long distances; optimizing shorter haul moves has proved challenging. The Staggers Act (1980)3 led to the break-up of rail lines into Class I (“national”) rails, Class II (“regional”) rails and Class III (“short line”) rails, with the latter accumulating smaller markets and lower margin operations. Table 2 below, also derived from Transearch, shows Ton-Mile traffic in the US by LOH for 2004. These data change slowly over time because surface transportation generally changes only with GNP growth and because the high cost of infrastructure additions preclude large, rapid shifts from one mode to another. In 2004, rail carload moved 269 billion ton-miles of freight and rail intermodal moved 60 billion ton-miles of freight in the 300 to 1200 LOH segment. Highway truck traffic in the same period and segment was 2.05 trillion ton-miles of freight. Rail is reported to move 400 ton-miles per gallon of fuel (adjusted)4, while highway freight is pegged at 123 ton-miles per gallon, a difference of 277 ton-miles per gallon. Table 3 2004 Mode Share by Length-of-Haul Mileage Block – Million Gallons Fuel Consumed shows fuel consumed by mode and LOH segment. The 16.7 billion gallons of fuel consumed in the trucking category LOH segments in the table compare favorably with total fuel consumption of 33.9 billion gallons annually for all trucking LOH segments, including those under 300 miles, that have been independently reported by the Federal Highway Administration5. The American Association of Railroads6 suggests that a 10% shift of freight to rail could save one billion gallons of fuel per year. This is a revealing and startling figure that should be setting our national priorities. In Table 4 Fuel Savings from Modality Shift in 300 to 1200 Mile LOH Segment, a modality shift of 1% of traffic from the short haul trucking (300 to 1,200 miles) mode to intermodal rail will move 20 billion ton-miles from road to rail. As can be seen, a 1% modality shift from road to intermodal rail saves 116 million gallons of fuel per year. Since most highway freight in these segments is transported by diesel trucks, using 7 gallons per barrel exchange, the 1% shift could reduce crude requirements by 16 million barrels per year. Since other refinery products have demand on the basic barrel of oil, not all this shift may be realized. At $60 per barrel, this has a favorable effect of that might reach $1 billion per year on the nation’s balance of payments. Consumption of diesel fuel contributes 22 lbs. of CO2 to the atmosphere for each gallon of distillate consumed7. This same fuel savings reduces total carbon footprint by 1.2 million tons of CO2 per year. This means that substantial reductions in greenhouse gas production can be achieved using existing, low-risk, readily available technology. Most Class I railroads are operating at or near capacity in many of their lanes. A 10% shift of freight to only Class I operators may not be possible. However, regional railroads and short lines have capacity and are normally looking to increase revenues and profits, but the high cost of intermodal terminals and equipment have traditionally precluded these firms from entering the intermodal market. The American Short Line and Regional Railroad Association (ASLRRA)8 study provides an opportunity to compare capacity shown in Table 5. Local and regional rail operators are firms that can actually accommodate a modal shift to rail from highway. A 15% increase in their operating levels would offer almost 75% of the capacity required to accommodate a 1% modality shift from highway to rail in the 300-1,200 Mile LOH segment. The balance would amount to an increase of 1.5% in the operating level of total intermodal capacity and only 0.6% in total Class I rail capacity. Since the shift target is in the short haul LOH segments, it is reasonable to expect that much of that new demand could be absorbed by short lines and regional railroads. The high cost of intermodal equipment and terminals have long been a barrier for short line and regional railroads entry into intermodal. In fact, most Class I operators require on the order of 100,000 payloads per year for the profitable operation of an intermodal terminal and for the full amortization of all costs. Traditional intermodal terminals can cost on the order of $25 million or, in some cases, significantly more to construct. Not only is high cost a barrier to new short-haul terminals, it has also led to the closure of many existing terminals to concentrate traffic at major hubs. Typically the intermodal traffic gets to major hubs by road, which contributes to high fuel consumption, traffic congestion and operating cost associated with highway freight haulage. RailRunner offers a solution to this dilemma and a path for shifting 1% or more of short haul highway traffic from road to rail with its Terminal Anywhere® technology. RailRunner rolling stock and direct operations are competitive in speed and cost with traditional intermodal. Typical RailRunner terminal investment, for equipment, ground preparation and all facilities are in the $1 million to $2 million range, which allows profitable operations at much lower transaction levels. 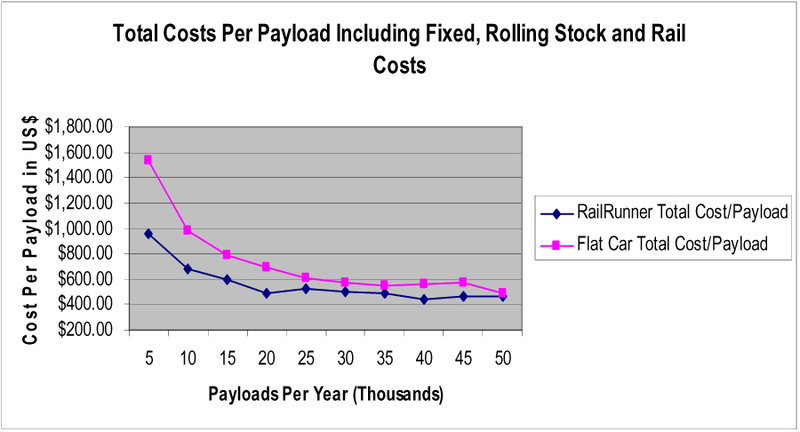 Figure 1 is from RailRunner9, showing the difference in cost per load between traditional intermodal using double-stack and RailRunner operations at volumes below 50,000 payloads per year. Short haul operations generally have lower transaction levels so RailRunner operating models offer significant advantage to these lanes. Some railroads and some regions do not have local infrastructure to provide the height clearance necessary for double-stack operations. This often true where freight lines are shared with electrified commuter rail lines. In these cases, single layer flat cars are used, rather than double-stack well cars. Compared to traditional flatcar intermodal operations, RailRunner yields are equal or better for all ranges of volumes. This supports conversion to intermodal via RailRunner in urban and suburban areas but at a dramatically lower investment and operating levels than normally associated with traditional intermodal operations. Shifting highway freight traffic from road to rail in a developed economy such as the United States can generate significant reductions in carbon fuel consumption, for as little as a 1% shift in short haul traffic segments (300 miles to 1,200 miles). Annual reductions of as much as 1.2 million tons of CO2 are achievable using readily available technology, without a negative impact on economic growth. Since the modality shift for short haul intermodal offers lower cost operation than truck transport, economic productivity and growth is enhanced. Capacity to accommodate the modal shift can be shared among both Class I and smaller railroads. RailRunner’s Terminal Anywhere technology offers a currently marketed, affordable route to implement a program to save over 100 million gallons of fuel per year, with approximately $1 billion reduction of oil imports. 3 A good discussion of the Staggers Act. 4 The American Association of Railroads reports over 457 Ton-Miles per gallon of fuel, which we have adjusted downward to reflect short trucking drayage movements at each end of the rail movement.